For Attorney Charles E. Boyk, results speak for themselves. Attorney Boyk sought the help of Foster Web Marketing when he wanted to increase the online marketing presence of his law firm. Through the help of Foster, he is now ranked on page one of Google for almost every search term that is applicable to his practice. 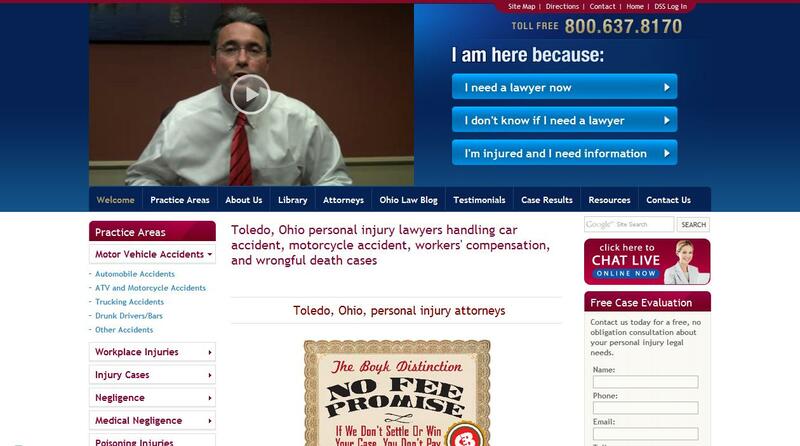 Any Ohio resident searching online for a personal injury attorney will inevitably come across the dynamic and engaging website for the Law Office of Charles E. Boyk. This type of exposure directly correlates to high quality leads and an abundance of new clients. Attorney Boyk contacted Foster asking for results, and results are what he received. Ranking on the first page of search results for the most popular search engine in the world is the gold standard for any law firm marketing strategy. Attorney Boyk ranks on page one not just for one or two search terms; instead, his firm is present for nearly any type of search term that is in any way applicable to his legal practice. He is impressed with Foster Web marketing for more reasons than just these excellent results, however. Foster was able to deliver on its promises while providing a true personal connection with clients, prompt responsiveness, and excellent service. The outcome is clear: Foster Web Marketing delivers law firms a strong and optimized online presence that directly correlates to new, high-quality leads. These leads are then converted to new clients for the firm as a result of the marketing tools that Foster Web Marketing provides. Want to learn more about how successful Internet marketing can deliver impressive results for your practice? We encourage you to view our free report, Explode Your Practice Through Internet Marketing today, and contact us for more information.